WRL’s counter-recruitment work provides young people and their allies with the resources and training necessary to agitate against military recruitment in their schools and communities. We work with a number of national organizations and coalitions, including Ya-Ya Network (Youth Activists Youth Allies Network), and Project YANO (Project on Youth and Non-Military Opportunities). NNOMY's Back‐to‐school Kit for Counter‐recruitment and School Demilitarization Organizing includes basic material useful to educating young people and school personnel about the realities of military enlistment and war, and encourages people to use the above WRL resources. 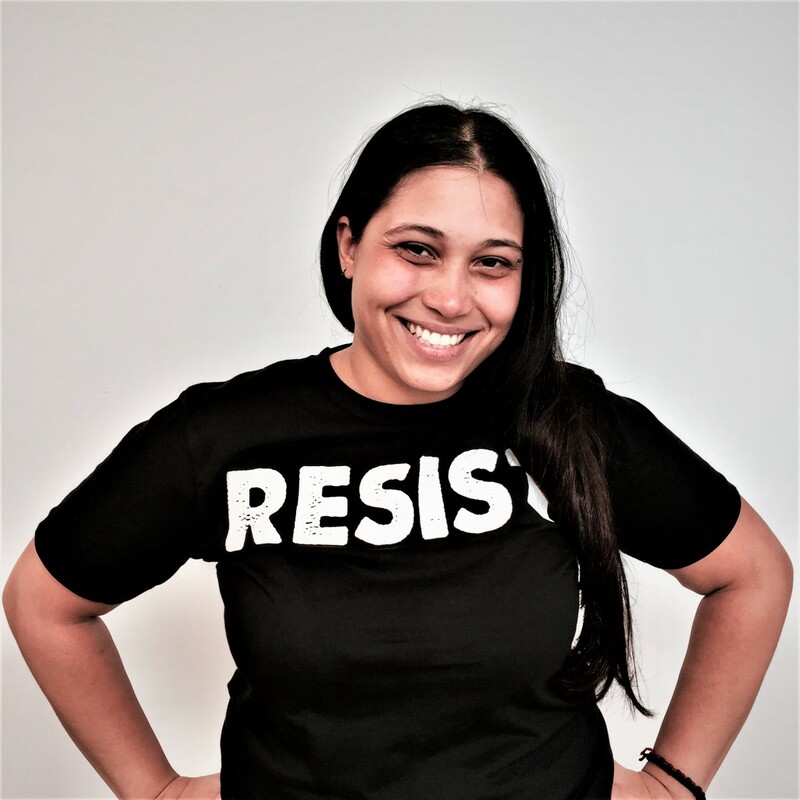 The kit includes some information on alternatives to enlistment, as well as items written for organizers seeking to reach out to local schools. We offer counter recruitment workshops and trainings for students, activists, and educators. Email wrl [at] warresisters.org for more information. Since our founding in 1923, the War Resisters League has been committed to supporting conscientious objectors, GI resisters, and military families. Currently, our work on this issue is done primarily through the GI Rights Hotline and through collaborative and coalition work with veteran's organizations to support the growing movement in CO's and resisters to the current wars. We work closely with Iraq Veterans Against the War. For a recent collaboration, check out the Right to Heal Initiative, organizing that demanded both reparations for Iraqis as well as care for returning veterans. We also work with many Veterans for Peace, military veterans and allies who are involved in a number of projects. Their Vietnam Full Disclosure Campaign is dedicated to an honest commemoration of the American War on Vietnam 50 years ago. The GI Rights Hotline, 877.447.4487, provides free, confidential, and accurate information on US military regulations and practices to servicemembers, veterans, potential recruits, and their families. It is a network of nonprofit, nongovernmental organizations. For ongoing work on conscientious objection, please see the great work of the DC-based Center on Conscience and War, which works to extend and defend the rights of conscientious objectors. CCW supports all those who oppose their participation in war, including those members of the US military who, following a crisis of conscience, seek discharge as conscientious objectors. Lo Que Toda Chica Debe Saber Sobre la Milicia de EE.UU. 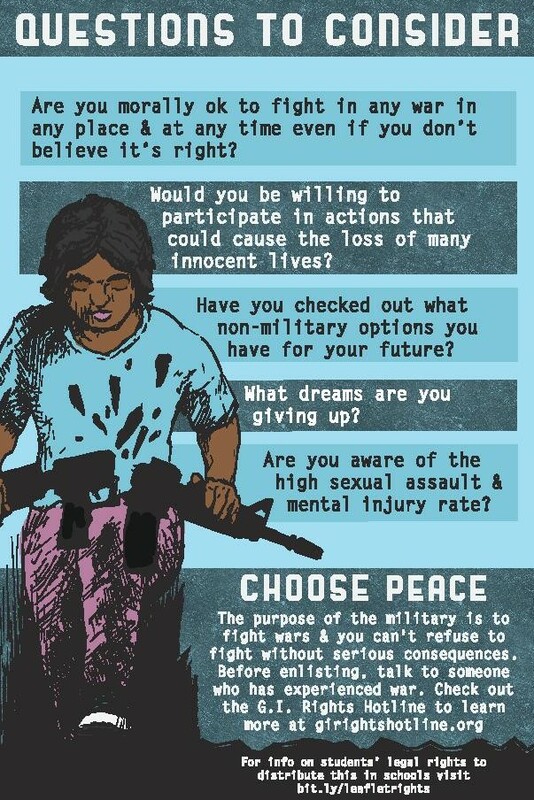 Written for girls, queer and trans youth, youth of color and poor youth, this newly redesigned full-color What Every Girl Should Know About the U.S. Military brochure is focused on sexual & gender-based violence: perfect for distributing at schools & community centers. Available in English and in Spanish: Lo Que Toda Chica Debe Saber Sobre la Milicia de EE.UU. Know Before You Go is a collaboration with the Ya-Ya Network, a youth of color-led antimilitarist organization based in NYC. The leaflet breaks down the enlistment contract and life in the military and provides new stats about sexual assault in the military, racial disparities in becoming an officer, and stop-loss. ¿Solo un empleo? ¡No!... Son ocho anos de tu vida! This essential counter military recruitment pamphlet, produced by Project YANO (Youth and Non-Military Opportunities) includes information that should be seen by every person considering joining the military. Activists across the country distribute this flyer in schools, at job fairs and community gatherings. Written for high school students who may be considering going into the military or have friends who are. Good for mass leafletting and as an eye-catching handout at a counter-recruitment table. Information taken from brochure “The Military's Not Just a Job... it's Eight Years of Your Life”, this full color glossy palmcard includes a link to that leaflet and to information on student's rights to distribute the palmcard in school. 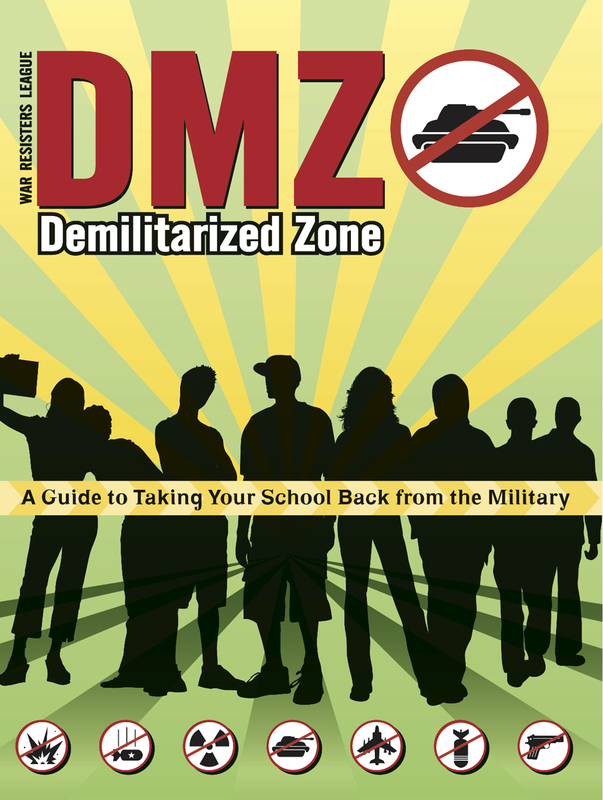 DMZ is a comprehensive counter military recruitment organizing manual for youth activists and their allies. This 48 page magazine-style handbook includes everything you need to know about organizing to keep military recruiters out of your school, including detailed legal information, concrete campaign suggestions, and key statistics. Originally published in 2008, DMZ comes with a sheet of updated information. 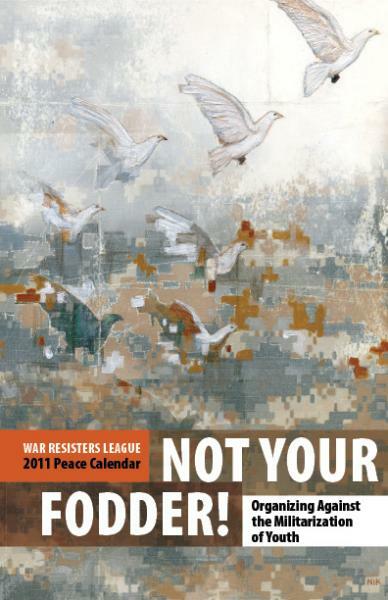 WRL’s 2011 Peace Calendar, edited by Oskar Castro & Judith Mahoney Pasternak is a directory of counter-military-recruitment projects around the country. The calendar serves as colorful documentation of this vibrant grassroots movement as well as an organizing resource. Go to our online store for more resources!